Cardiovascular disease (CVD) is the main cause of death in Europe, accounting for nearly half (45 per cent) of all deaths, according to a new Oxford study funded by the British Heart Foundation (BHF). There are around four million deaths from CVD across Europe each year including more than 150,000 in the UK. 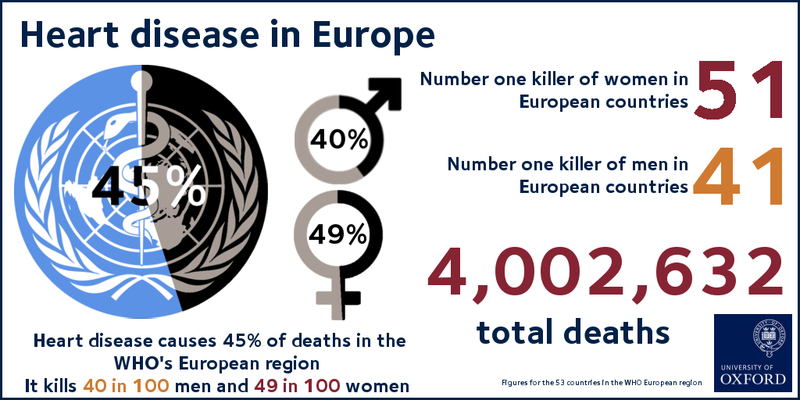 The analysis, led by Dr Nick Townsend, Senior Researcher at the BHF Centre on Population Approaches for Non-Communicable Disease Prevention at the University of Oxford, showed that nearly half (49 per cent) of all women in Europe die due to CVD compared with 40 per cent of men. But the study, published in the European Heart Journal, also illustrates the success of work by the BHF and others in fighting heart disease because CVD is no longer the main cause of death in several countries in Western Europe. The countries include: Belgium, Denmark, France, Italy, Luxembourg, The Netherlands, Portugal, Slovenia, Spain and the UK. Coronary heart disease remains the single biggest killer in the UK, responsible for nearly 70,000 deaths each year. The nation’s leading heart charity is urgently calling for more research to improve diagnosis and treatment of heart and circulatory conditions. Dr Mike Knapton, Associate Medical Director at the British Heart Foundation, which funded the study, said: 'Our research has helped halve the annual number of deaths from cardiovascular disease in the UK since the BHF was created more than fifty years ago. This study is a reminder of the tremendous progress that has been made in fighting heart disease in the UK and across Western Europe.